North Carolina Conservative Leads The Charge Against House Health Care Bill : Shots - Health News Republican Rep. Mark Meadows enjoys strong support in his western North Carolina district as he leads conservative opposition to the GOP's health overhaul plan. Rep. Mark Meadows, R-N.C., chair of the House Freedom Caucus, speaks during a news conference on Affordable Care Act replacement legislation in February. In this corner of Appalachia, poverty takes a back seat to art galleries, country clubs, golf course communities, five-star restaurants, and multimillion-dollar houses. From this perch in Highlands, N.C., Congressman Mark Meadows, a real estate entrepreneur who capitalized on the area's transformation to a prosperous retirement and vacation community, rose to political power quickly. 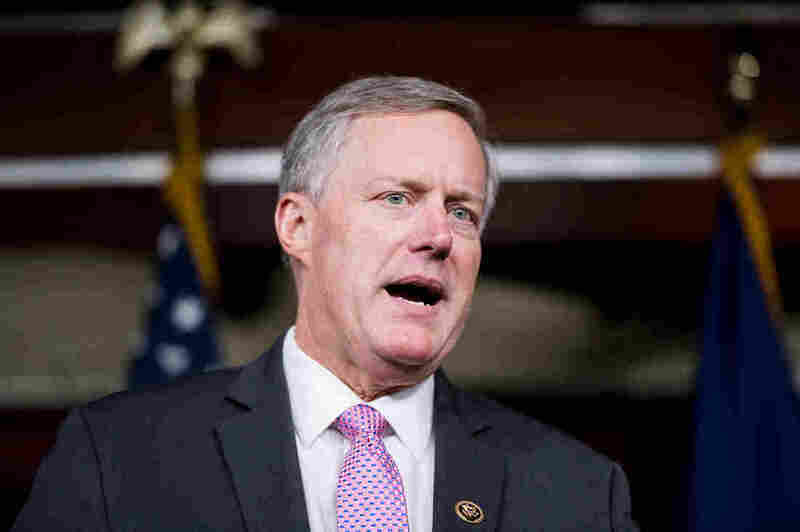 Now, Meadows leads the House Freedom Caucus, controlling about 30 votes and showing few qualms about endangering his party's best chance to repeal the Affordable Care Act. Meadows, who has called the GOP health bill replacement "Obamacare Lite," said Thursday on MSNBC: "I am willing to invest the political capital to get it right. The next week is critical." And on Saturday, Meadows went to President Trump's Mar-a-Lago club in Florida to negotiate over the bill with Trump aides, along with with Sen. Ted Cruz, R-Texas, and Sen. Mike Lee, R-Utah. His gerrymandered district covers 17 counties and spans 150 miles of western North Carolina. The populous liberal bastion of Asheville is mostly carved out of his district like a bite from a cookie. What's left is a retiree-rich constituency of 750,000 people that is heavily Republican, mostly white, and lives mainly in small, rural towns amid pockets of extreme wealth. Its survival, however, could hinge on a Supreme Court ruling expected this year over whether racial bias tainted how the state legislature drew North Carolina's congressional map. Elected in 2012, Meadows, 57, has rebelled against the establishment Republican Party. He helped shut down the government in 2013 and oust John Boehner from his House speakership in 2015. The natural beauty of Rep. Mark Meadows' district helped transform parts of it into a vacation and retirement community. 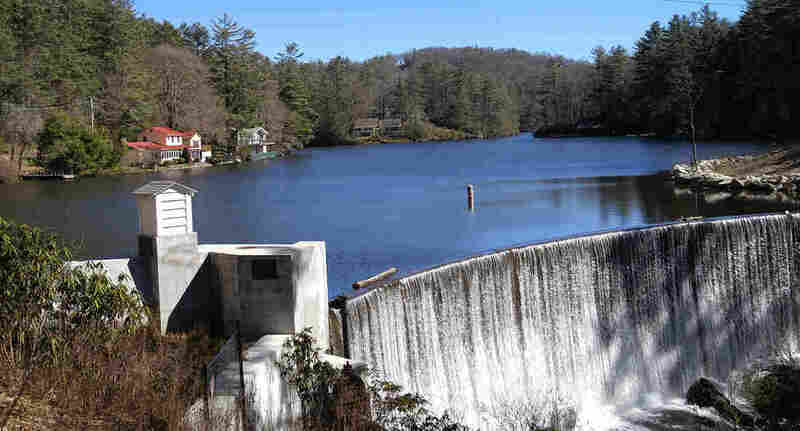 This dam is on Lake Sequoyah. While Democrats and even moderate Republicans decry House Speaker Paul Ryan for cutting federal aid to help get people insured in the GOP bill, Meadows says the cuts don't go deep enough. He vows to oppose any ACA replacement that does not bring down health costs for people and government. No such plan is on the table, however. Meadows wants to cut off all 10 million Americans who today get federal subsidies to buy health coverage, which he says the country can ill afford. With enough support, Meadows could either block the House leadership from passing its plan or force it to approve a more conservative replacement that would face little chance of getting through the more moderate Senate. Meadows' potential role as "Trumpcare" spoiler is stirring concern in the White House and Congress. By Thursday, Meadows seemed to have gotten that message. "The last thing I want is for the president to be mad at me," Meadows told Politico. "He asked me to negotiate in good faith, so I have been working around the clock." But his hard line doesn't bother most folks back in his part of North Carolina, where the ACA, also known as Obamacare, is unpopular. Only about 5 percent of those in his district receive government-subsidized health plans made available by the law. Meadows is revered by most constituents. Even the local hospital industry — which typically opposes any effort to scale back the health law — remains firmly in Meadow's corner. "We are big fans of Mark. He's a man of integrity and he has the heart," said Jimm Bunch, CEO of Park Ridge Health, a 103-bed hospital in Hendersonville. He heaps praise on Meadows even as the congressman fights to eviscerate the law that helped the hospital achieve one of its best financial years ever. As more patients got insurance, Park Ridge gained $600,000 a year in funding it used to provide free care to other patients. Because North Carolina did not expand Medicaid under Obamacare, many poor adults there remain uninsured. But many residents did gain coverage. The state's uninsured rate fell from 20.4 percent in 2013 to 13.6 percent in 2016 — about three points higher than the national average, according to Gallup. 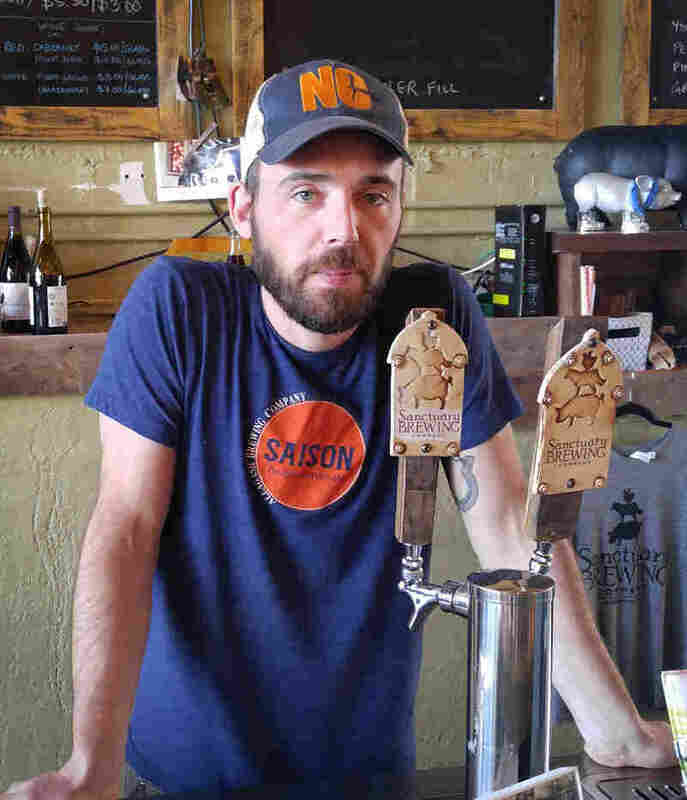 Joe Dinan, co-owner of Sanctuary Brewing in Hendersonville, N.C., says his subsidized health coverage under the Affordable Care Act paid for his skin cancer surgery this year. Small-business owners, who provide most jobs in the district, are reluctant to take on Meadows, even if they've benefited from the ACA. At Sanctuary Brewing in Hendersonville, co-owner Joe Dinan said the Obamacare coverage helped him get surgery for skin cancer on his head. "I don't want to see the subsidy end," Dinan said. He won't say anything critical about Meadows, though. Meadows insists no one will get left behind. He wants to allow people to buy less-expensive policies with fewer benefits than now required under the ACA. His tax help would be in the form of year-end deductions or a break on their payroll taxes — different than both the current law and the GOP replacement plan now before Congress. That infuriates Kent Loy, a thrift-store volunteer in Hendersonville. "It's an attack on the poor," said Loy, 71. "This should disqualify him from office." But it won't, said Chris Cooper, professor of political science at Western Carolina University. Meadows drew 65 percent of the vote in November. "Taking out Asheville turned the district from being the most competitive district in the state to the most conservative," Cooper said. The political climate is challenging for cultivating grass-roots opposition to Meadows, according to activist Susan Kimball, of Waynesville, N.C., who is part of Progressive Nation WNC, a group pushing to retain the ACA. She moved to Waynesville from South Florida four years ago, and the area's conservatism has been an eye-opener. "We were just moving to the mountains and we didn't know the region would become Tea Party central," Kimball said. In an earlier version of this story, Park Ridge Health was incorrectly referred to as a Catholic hospital. It is not. It is part of Adventist Health System, a nonprofit Protestant health care system. A caption in the story also erroneously identified a dam on Lake Sequoyah as Dry Falls. The falls is actually downstream of the dam.